Limited release, 20 year old. Matured for almost 2 years in Palo Cortado sherry casks, Jerez Spain. Distilled and matured at Bunnahabhain distillery, warehouse No.08. An amber gold, Islay single malt Scotch whisky. Has a unique fusion of sweetness with spice, crispness with intensity and a hint of dryness with a smooth, lingering finish. Available in an attractive presentation box which slides to open with an open-close cap to remove the bottle. Limited Release: Only 1620 bottles and individually numbered. Colour: Deep amber gold. Nose: Fresh berries and cream, with pecan walnut, rich oak and vanilla. 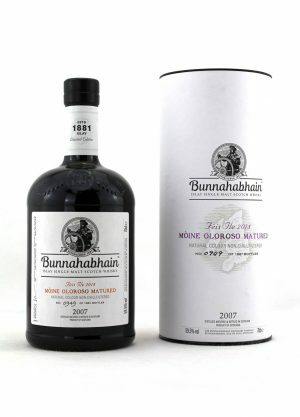 Finish: Long, dry finish with a hint of nutmeg-from Bunnahabhain. 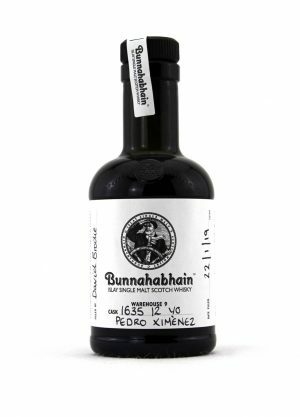 This Bunnahabhain Limited Release was specially selected for finishing in Pao Cortado casks. The rare sherry is known for its sweet, nutty, complex taste profile, with hints of cocoa and nutmeg to create this delicious, mouth coating dram- Andrew Brown, Distillery Manager.